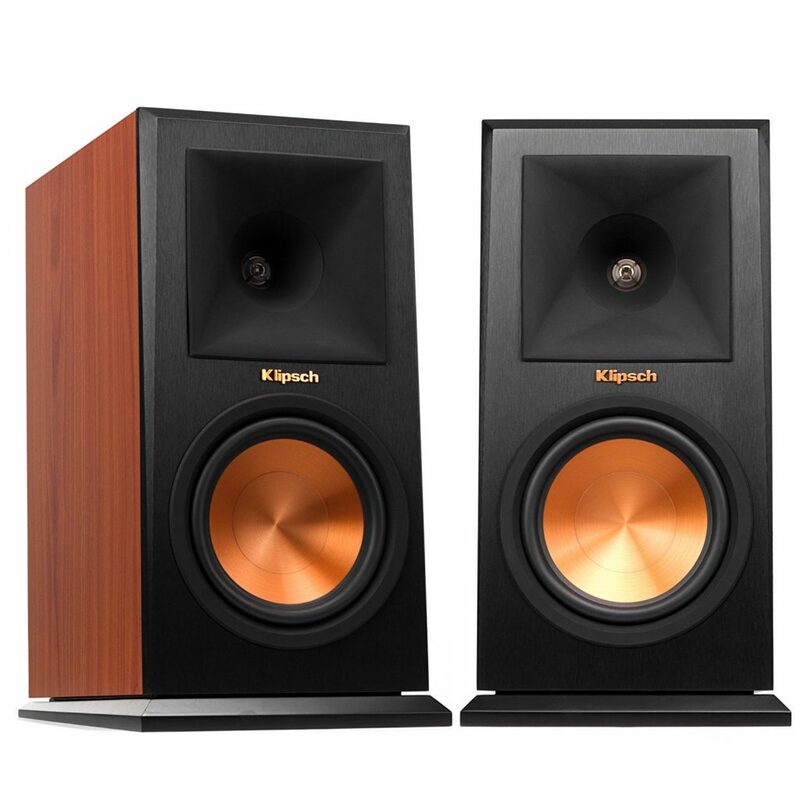 Klipsch Reference Premiere series of home theater speakers was released in 2015 and in three years, it has become one of the most popular and highest rated lines of speakers on the market. We are presenting to you the largest bookshelf speaker from the Reference Premiere series – Klipsch RP-160M. Klipsch RP-160M is maybe larger and heavier than an average bookshelf speaker but it is almost perfect in every other way. It features sophisticated and instantly recognizable Klipsch design with spun copper woofer and Tractrix horn tweeter. It’s made of quality materials – MDF was used for the cabinet, polymer veneer was used for the finish, the woofer is made of Cerametallic (which is a combination Ceramic and Aluminum) with polymer baffle, and the tweeter is made of Titanium and it’s placed inside the enhanced 90×90 Tractrix horn. What’s even better than the build quality is the sound. A pair of RP-160M will deliver an incredible listening experience. The sound is rich, detailed, and powerful. Klipsch even managed to make the upper midrange and high frequencies softer and more neutral by enhancing the design of the Tractrix horn (customers complained about the previous Reference line of speakers because the treble was too harsh). They will still be a bit too intense, especially in a small room but if your room is large enough, the speakers will show their full potential and you will notice that they really managed to make more neutral (and even wider) frequency response compared to the previous Reference series. 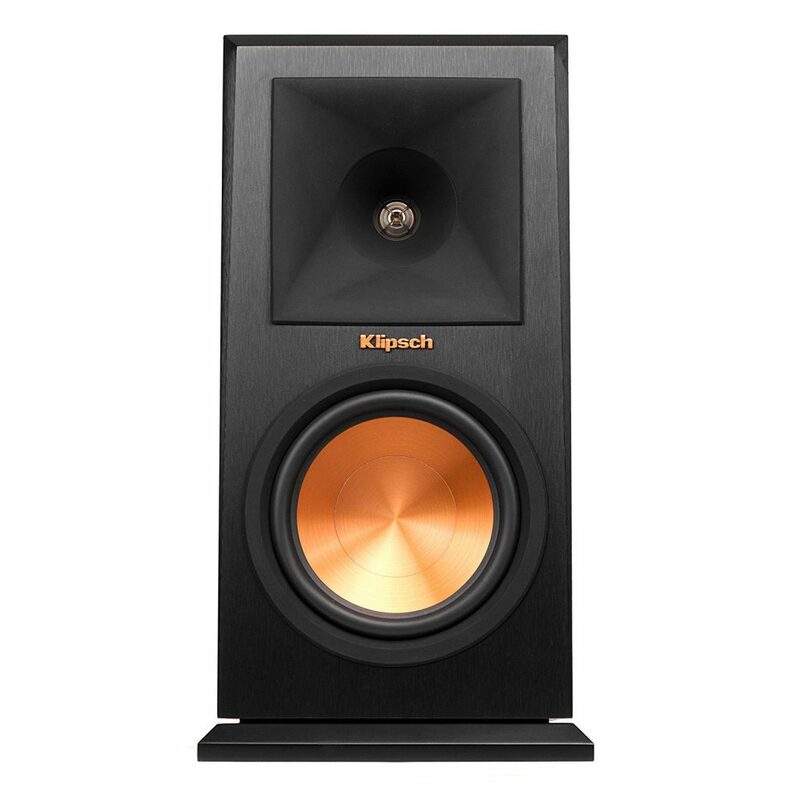 If you are looking for a great pair of bookshelf speakers for your home theater system or for a home audio system and if your room is large enough, Klipsch RP-160M is one of the best choices under $500 (for a pair). If you have a smaller room and you still want Klipsch bookshelf speakers, you might want to try the smaller version RP-150M. Both speakers come in one large cardboard box and they are both nicely protected with Styrofoam. Along with the speakers, you will get only user manual and 5-year warranty. Speaker wire is not included and it’s recommended to use 16, 14, or 12-gauge wire. The speaker comes with a nice-looking transparent cloth grille. The grille is magnetically attached to the speaker and it’s easily removable. When you remove the grille, you will see two drivers – spun copper Cerametallic woofer and a Tractrix horn with an LTS Titanium tweeter. You can use the speaker with or without the grille but we prefer the look without it. On the rear panel, you will see the bass reflex port at the top (it looks similar to Tractrix horn on the front side and it’s called Tractrix port) and dual binding posts at the bottom. These dual binding posts are designed for bi-amp or bi-wire connection but you don’t really have to use bi-wiring or bi-amping since these speakers are quite easy to drive. You can simply use a single 16, 14, or 12-gauge wire with 2 banana plugs and plug them into 2 posts (one red and one black). The speaker rests on a slightly angled wooden base. The whole enclosure is angled backward. MDF Enclosure – You won’t find any plastic on this Klipsch speaker. The whole enclosure is made of MDF which is the best replacement for wood (it’s dense, rigid, and non-resonant and it minimizes the distortion and improves efficiency). 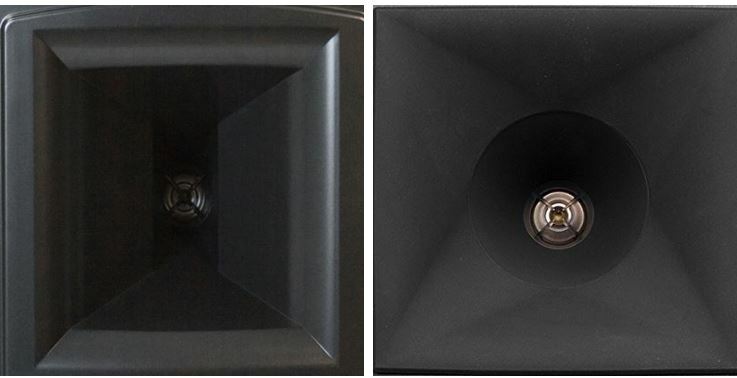 Enhanced 90×90 Tractrix horn and enhanced LTS (linear travel suspension) tweeter – Klipsch paid attention to customers’ complaints regarding upper-midrange and treble reproduction on the previous Reference series of speakers. Treble was too harsh and they decided to make it less intense (more natural and accurate). They decided to change the shape of the horn and combined circular shape around the tweeter (horn throat) with a square ending (horn mouth). They also used molded rubber to cover the horn surface in order to dampen the treble. Also, Klipsch used titanium for the tweeter in order to make the frequency response more linear. 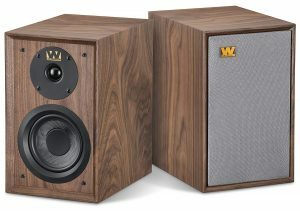 Cerametallic 6.5-inch woofer – Unlike the tweeter, the woofer remained basically the same as the woofer on the previous Reference line. The Klipsch used traditional spun copper Cerametallic woofer which combined with the enhanced tweeter and Tractrix horn makes RP-160M one of the most efficient speakers on the market. 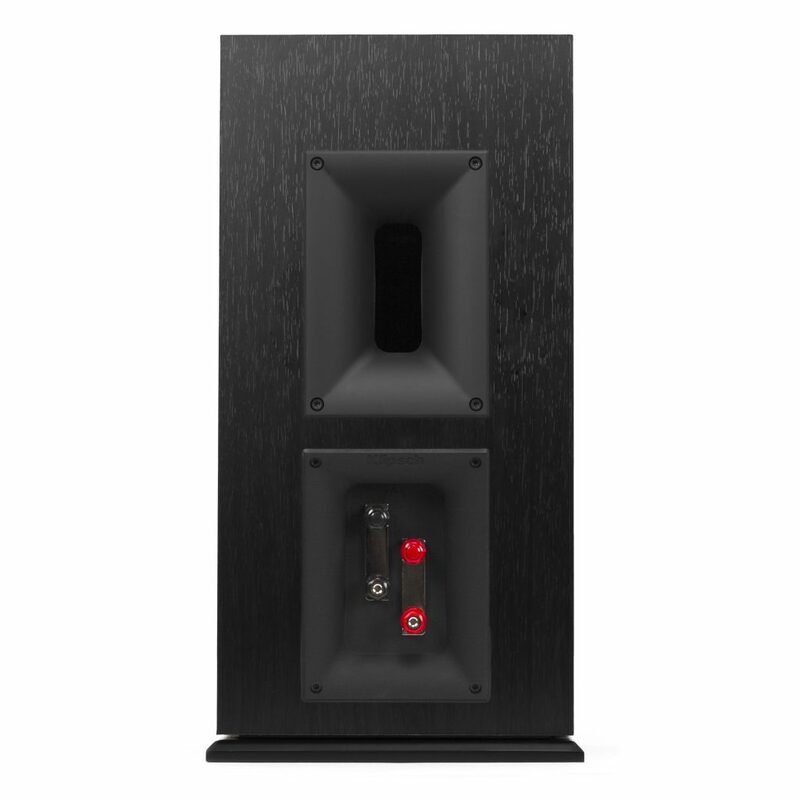 Tractrix (bass reflex) port – This is another enhancement compared to the previous line of Reference speakers. The previous line had front-firing racetrack-shaped bass ports, while the new Reference premiere series has a rear-firing port that’s shaped similar to Tractrix horn. That way, Klipsch achieved faster airflow and cleaner low-end reproduction. Dual binding posts – You don’t have to use all four ports but if you want to experiment with bi-amping (which could bring some improvements) or bi-wiring (which is kind of meaningless), you can. In our opinion, single wire connection works just fine but the bi-amp connection brings some improvements. First, let’s discuss a few things about the setup and speaker placement. When it comes to placement, you should follow the guidelines from the Klipsch manual. Klipsch RP-160M bookshelf speakers are supposed to be your front left and front right channels (but you can also use them as surround channels). They should be 6-15ft apart. The distance between the speakers and your listening position (couch, sofa) should be 1-1.5 times the distance between the speakers. So, if the distance between the speakers is 15ft, your listening position should be no more than 23ft away from the speakers. You are supposed to direct them toward your listening position and place them on stands so the tweeters are at your ear level. Also, the speakers should not be placed too close to the wall (try to place them 2ft away from the wall). When it comes to the setup and wiring, there are three options – simple single wire connection, bi-wiring, and bi-amping. 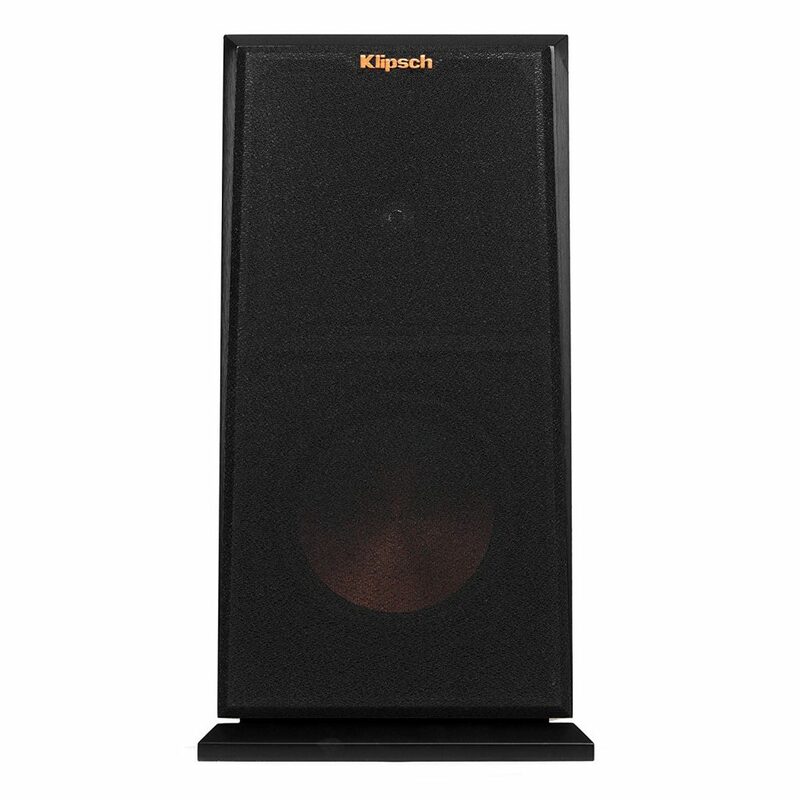 All the Klipsch Reference Premiere bookshelf speakers will perform just fine if you connect them to your amplifier via single wire (16-gauge, 14-gauge, or 12-gauge) with two banana plugs but they are all equipped with dual binding posts which means that you can experiment and try to bi-wire or bi-amp the speaker. Based on the experience of many audiophiles around the world, bi-wire connection doesn’t actually make a noticeable difference but the bi-amp connection could improve the speaker performance. 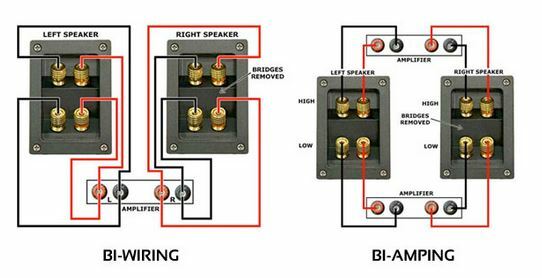 In order to bi-amp your speaker you have to use two sets of wires and two separate amps for one speaker – one amp drives the woofers and the other drives the tweeters. Bi-amping is more often used for wiring floorstanding speakers but you can definitely bi-amp your RP-160M bookshelf speakers. When it comes to sound quality and listening experience, we can’t really ask for more. Every type of music we have tried sounded authentic and vigorous. It doesn’t matter if you are listening to some classical piece performed by a symphony orchestra, power metal song, or a bass-heavy EDM, Klipsch RP-160M will deliver an authentic and powerful sound with an incredible amount of detail. The bass is deeper than you could possibly expect from an average bookshelf speaker but it’s also rich and perfectly clean without any distortion at high volumes. Treble was the biggest issue with the previous line of Klipsch Reference speakers but they managed to solve this issue by enhancing the design of the Tractrix horn and by enhancing the tweeter construction. RP-160M delivers much cleaner and less intense highs than the bookshelf speakers from the previous Reference series but they really need some space to shine. The highs will still sound too harsh in a small room, when your listening position is too close to the speaker and when the walls are too close. Midrange and vocals sound perfectly clear and dynamic. You will be able to hear the smallest detail – it’s almost like you are listening to a live event. To conclude, Klipsch RP-160M delivers a wide and neutral frequency response, wide soundstage and accurate stereo imaging. The sound is very detailed, rich, and powerful. 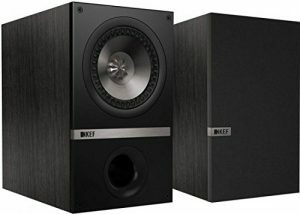 KEF Q100 is slightly more expensive than RP-160M and it’s more suitable for small rooms since it’s smaller, lighter, and more compact than RP-160M. They are both stylish but we prefer the design of RP-160M. Q100 is available in four colors – black, American walnut, rosewood, and white. Q100 features coaxial drivers (woofer and tweeter on the same axis) and it delivers very balanced sound with a powerful bass, very detailed mids, and sparkling highs. Compared to RP-160M, KEF Q100 delivers better (less intense) treble but RP-160 can go lower (deeper and more powerful bass). Wharfedale Denton is another great choice in case you need something smaller than RP-160M. This speaker really excels when it comes to midrange and treble but it’s not as deep and loud as RP-160M. Denton is priced slightly higher but it’s still under $500 (for a pair) and it performs equally great. The main reasons for buying Denton instead of RP-160M are the size and more detailed and cleaner treble. You would have to pay approx. $100 more for a pair of DALI ZENSOR 3 but you won’t regret it if you are searching for the perfectly balanced sound and controlled punchy bass. 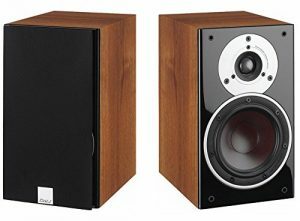 DALI ZENSOR 3 is, just like the previous 2 competitors, smaller and lighter than Klipsch RP-160M. It delivers even more neutral sound than RP-160M but Klipsch’s bookshelf speaker is much louder and delivers deeper and stronger bass. The bass on ZENSOR 3 is more controlled. ZENSOR 3 delivers perfectly detailed and accurate mids and highs and very wide soundstage. Klipsch RP-160M meets all the sound principles established by the founder of Klipsch corporation (Paul W. Klipsch) and it’s probably better than any previous bookshelf speaker made by Klipsch – it has a wide and neutral frequency response, the distortion is practically nonexistent, and it’s highly efficient. A pair of RP-160M will deliver a wide soundstage with a perfect stereo imaging, excellent directivity, and a nice balance between low, mid, and high frequencies. RP-160M is, without any doubt, one of the best choices when it comes to bookshelf speakers under $500. Klipsch RP-160M can be a part of your home theater system or home audio system. You can use a pair of RP-160M speakers as your front left and right channels or even as your surround channels. For the best results, you should combine RP-160M with other speakers from the Klipsch Reference Premiere series. If you need a center channel, you should check out RP-250C or RP-450C. The best choices for surround channels are RP-240S or RP-250S and depending on the size of your room, you can get a 10-inch, 12-inch, or 15-inch Klipsch Reference Premiere subwoofer (R-110SW or R-112SW or R-115SW). In case you have a really large room and want even bigger sound, you can always use Reference Premiere floorstanding speakers instead of bookshelf speakers. There are two available versions RP-280F (larger) and RP-260F (smaller). If you want a bookshelf speaker made by Klipsch but you need something smaller, you might want to check out RP-150M which comes from the same Reference Premiere line. All the speakers we’ve mentioned in the previous chapter (KEF 100, Wharfedale – Denton, and DALI – ZENSOR 3) are great choices, too. Your final decision depends only on your sound taste and your budget. The main difference is the size. As you probably know, bigger speaker means bigger and more powerful sound. RP-150M dimensions (WxHxD) are 7.67×14.57×10.67in while RP-160M dimensions are 8.81×16.67×12.86in. What’s even more important, RP-150M features 5.25in woofer while RP-160M features 6.5in woofer. RP-160M is louder, more powerful, and it delivers deeper and punchier bass than RP-150M. Hi thanks for the really informative review. One question I have is: what size room is to small for these? You mention room sizing multiple times but never actual demensions. I’m looking to incorporate these into a 16×14 dedicated media room. Is my room large enough or would I be better suited with one of the smaller Klipsch offerings? It’s our fault and we apologize. Assuming that your ceiling height is 8ft, a small room would be anything smaller than 10×12. Anything larger than 10×12 but smaller than 20×15 is medium. Anything larger than 20×15 is a big room. To be completely honest, there will never be a unanimous agreement on what is small and what is large. These numbers are just approximations. Still, we don’t think that 16×14 is small.